For the past six years, I've celebrated Canada Day in much the same way: strolling through Osborne and Corydon Village in my skin-tight Speedo with the Canadian maple leaf on the crotch, stopping at Liquid Lounge, and downing two or three Maple Leaf martinis - a tasty blend of vodka, cinnamon, and maple syrup. Then the cops would take me to the Alexander Docks for "choir practice," and I'd call it a night. It worked for me, but there's no Liquid Lounge anymore (something about a mysterious fire) and, therefore, no Maple Leaf martinis. And, this year, I won't even be here for the big day. What's a sad and lonely Canadian to do? Innis & Gunn to the rescue! The Scottish brewer has released a Limited Edition Canadian Cask beer, just in time for Canada Day. Developed solely for the Canadian market (which the brewer says is one of its top six markets), the beer uses: "Canadian whiskey barrels, packed with delicious flavors, locked deep inside the oak grain. Over many weeks, our maturation slowly unlocks these flavors from deep inside the oak grain, the beer growing in character with every hour that passes. The result of this process is a delicious beer with enormous depth of flavor." What kind of Canadian whiskey? Unknown. But the brewer says that some of the barrels it used are as old as 50 years (Michael Jackson's age! Sorry, all writers are legally obligated to sneak his name into their stories for another week). But the whiskey barrels are a change for the brewer, which normally brews its beer in bourbon and rum casks. At $5 a pop, the beer had better be amazing, and - I'm delighted to report - it is. 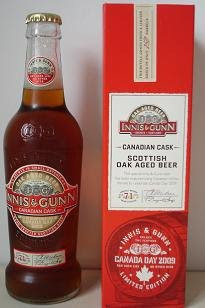 Innis & Gunn is a smooth and flavorful beer and, to my taste, the Canadian edition is even better than the others: it includes the addition of malted rye, which gives the beer a deep, red color and scent of toffee, malt, vanilla, and orange. It's like beer meets distilled spirits meets candy. Mmmm. Candy. Among my circle of friends, no brand of anything has generated as much buzz in recent years as Innis & Gunn - uh, in more ways than one. I first heard about it when an injured friend went on Worker's Comp, and - like anyone on Worker's Comp - needed something to do during the day. Turns out, there's nothing better to do than drink a smooth, premium beer courtesy of the taxpayers of Manitoba. What could be more Canadian than that? His girlfriend would leave for work around 11 a.m., at which time he'd break open the beer in celebration of another day of funemployment. His injury eventually got better, and the fun ran out with the Worker's Comp - but I'm happy to report that his taste for the beer did not. Nor did his friends'. Nor did mine. Nor did my friends. Etc. I told my advertising class this story on a Friday, relating it to how quickly buzz around a brand can spread among social groups. When I asked the class about it again the following Monday, more than one person that weekend had made a special trip to the liquor mart to pick up a bottle of Innis & Gunn to try it for themselves. And they had told their friends. Who had told their friends. Etc. To make a long story short: now I can't find Innis & Gunn in the liquor mart anymore. The downside of buzz? Supply and demand. Sigh. So, if you happen to be in Osborne Village today, and you find yourself hankerin' for a tasty Canadian-themed beer, and the liquor mart is open, and the special edition Innis & Gunn is in stock, and you have enough money on you: have one for me, OK? Delighted that you enjoy our beer so much! Belated Happy Canada Day from Innis & Gunn! Will you do your part in the Donut Wars? "God bless them Beatles for what they done"
Has journalism become too much about journalists?